/ What is a Juice Cleanse and Should You Do One? Juice cleanses: We’ve all heard of them. Certainly most of us want a healthier lifestyle, but are juice cleanses the way to go? 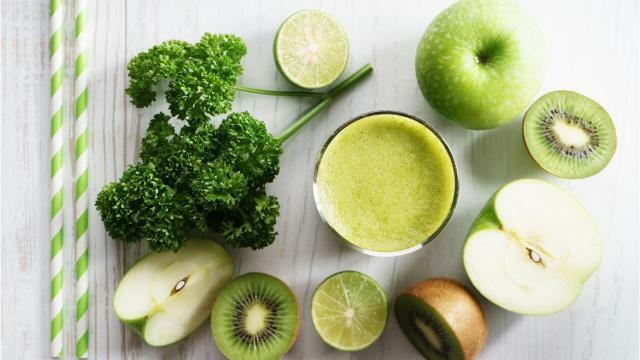 Juice cleanses promise health benefits and weight loss, and it sounds like a golden opportunity to get more fruits and vegetables in your diet in a fun and interesting way. But is it all it’s made out to be? Let’s find out! Juice cleanse is often used interchangeably with “juice fasting” or “juice feasting,” where you decide to drink nothing but a wide variety of fruit and veggie juices for an allotted period of time. Not only does it mean cutting out solid foods and replacing them with fresh juice, unless you want to invest a lot of money with pre-made juices, you most likely have to juice at home. Juice cleanses are used to detox the body of toxins and “bad foods” that you’ve consumed over a long period of time. People often use juice cleanses after a long vacation (have you ever been on a week cruise with a 24 hour buffet? ), or perhaps after a particularly difficult life situation. It’s not uncommon to go on a cleanse as a way to “reset”, or start over if you are trying to change your lifestyle. The interesting part about juice cleanses is the time it takes to do one. Unlike other diets, juice cleanses can be from literally one day to two months, depending on what you’re trying to do or health goals you’re trying to reach. It is recommended however for you to not go on a 60 day juice cleanse if this is your first time ever juicing. That’s the sort of thing you work up to! It is important to note that no two juice cleanses are alike. There are juice cleanses for diabetes, for weight loss, for increased energy, or simply to try it out with simple recipes. As previously mentioned, many people go on a juice cleanse for a day or two to regulate their health cycle after a few days of indulgent eating. There are also several juice cleanses that involving eating soups and salads as a way to make it less “intense” of a change. So whatever you’re looking for, you can design a juice cleanse to suit your unique needs. Though there are many pros to juicing, as with any cleanse, there will almost always be cons as well. Your body will react to any change in your normal diet, and a juice cleanse (even for a short amount of time) is an intense endeavor. So what can you expect? Here’s a look at the pros and cons of doing a juice cleanse! Pro: You get your daily fruits and vegetable intake a lot easier and quicker than normally. A single serving of juice (depending on what kind of juice cleanse you’re doing, that could be 8-20 oz per serving) has many servings of fruits and vegetables, all in delicious, drinkable form! Con: You lose fiber from your diet. Yes, some fruits and veggies have fiber, but if you’re juicing for longer periods of time, you do not receive the high fiber content from a regular diet that is necessary for a well balanced health regime. Pro: You may lose weight when you juice. Many studies have shown that most people lose weight if they do a week of juicing: on average 10-12 pounds! Converting all of those fruits and veggies into juice, along with a temporary lifestyle change, can make your body respond in a big way. Con: You may NOT lose weight when you juice. For as much as people do lose weight, this isn’t a foolproof plan. When you’re juicing, especially the first three days, you’re going to feel hungry. Switching to a fully liquid cleanse is not easy, and you’ll be tempted to eat to feel satisfied. And because some juices do not have significant amounts of protein, if you’re trying to build lean muscle mass, you are out of luck. Pro: You will have much healthier skin, hair, nails, and hygiene. When you juice, you are digesting daily a concentrated amount of vitamins and minerals and your body is thanking your for them. Many juice cleanse participants have reported that their skin looks radiant! Con: You may end up with more sugar in your juices if you’re not careful. Because juicing removes the insoluble fiber from fruits and veggies, you can get a load of sugar without the fiber that normally slows down the sugar absorption. So stay away from juicing too much sweet fruits as the sugar rush can result in headaches, shaking, blood sugar swings, mood swings, crashes and so on. Stick to the 80/20 rule of 80% veggies and only 20% fruits in your recipes to avoid this sort of sugar overload. Pro: There’s lots of variety. When you juice, you’re not drinking the same three fruits and veggies every day. The world has so many varieties and styles of fresh fruits, veggies and verbs so take advantage of it to experiment with different levels of sweetness and flavors. Juicing helps you try new things, and you’d be surprised at what you enjoy. Kohlrabi juice, anyone? Con: If you’re not careful, it can get expensive. Remember, when you’re juicing, you’re compacting many, many more fruits and vegetables together. Usually you eat a fraction of the produce whole. And because many juice recipes require you to buy organic, things can add up really quickly. So plan ahead to go to bulk grocers to ensure maximum bang for your buck or even try growing your own greens. Doing a juice cleanse isn’t for everyone, but has many pros if you decide to take on the challenge and the cons are certainly avoidable. Whether you decide to supplement your diet with more juicing, or go for the 30 day challenge like a pro, juice cleanses provide you with a way to get to know your body better and to ‘reset’ for a healthier lifestyle.